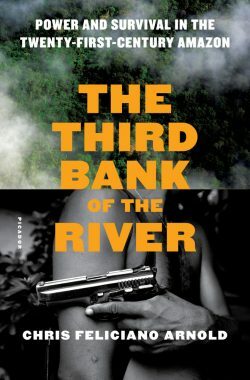 We spend the hour talking with Chris Feliciano Arnold about his book, The Third Bank of the River: Power and Survival in The 21st Century Amazon (Picador USA, June 2018). It’s a sweeping investigation of crime and corruption in the Amazon, all the more relevant now that the extreme right-wing politician Jair Bolsinaro has been elected President of Brazil. We originally spoke with Chris Arnold before the election, but were able to get a post-election update from him to add to the program. If you like Writer’s Voice, give us some love on iTunes or your podcast app and friend us on Facebook. The Amazon forest is often called the “lungs of the planet”. Covering an area of over 2 million square miles, it plays a critical part in our planet’s ability to absorb carbon from the atmosphere. It’s also home to more than half the world’s species of plants and animals. Cutting down the forest is a danger to the people and animals of the forest. It also endangers the very system that supports life on earth. But, as Chris Arnold demonstrates in The Third Bank of the River, despite attempts in recent decades to protect the forest and its peoples the threats to the Amazon are not going away. Illegal logging, gold mining and the international drug trade continue their inroads. And now, with Bolsinaro’s election as Brazil’s president, the threat has only increased. Grounded in rigorous first-hand reporting and in-depth research, Chris Arnold’s book is a portrait of Brazil and the Amazon that is complex, bloody, and often tragic. Chris Feliciano Arnold has written essays and journalism for The Atlantic, Harper’s, The New York Times, The Washington Post, and many more venues. His fiction has been published in The Kenyon Review, Ecotone and other magazines. He teaches writing in the MFA programs at the University of San Francisco and Ashland University.